Please try to keep your pets safe over this festive period as there are many temptations out there along with food, tinsel and toys. 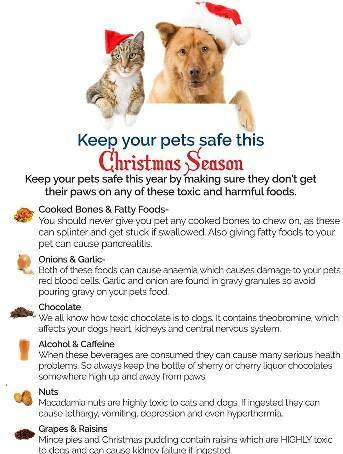 If your pet eats any of the following foods shown on our poster, please contact the surgery on 01224 486444 for advice on how to deal with this as quickly as possible. An emergency veterinary service can also be contacted on this number out of hours. Ashgrove Vets and their staff wish all our clients and their pets a very Merry and Safe Festive period.